Zero: The Runtime of Shah Rukh Khan, Katrina Kaif and Anushka Sharma's Film REVEALED! With just a couple of weeks left for 2018 to end, we still have two more Bollywood biggies to come out this year. Zero and Simmba are left to be screened for the audiences, with the former coming out on December 21 and the latter on December 28. Talking about Zero, the movie stars Shah Rukh Khan playing a vertically challenged man in love with two women. Anushka Sharma and Katrina Kaif play the female leads. Zero is directed by Aanand L Rai. Zero New Promo: Shah Rukh Khan as Bauua Singh Makes It Rain Money - Watch Video. 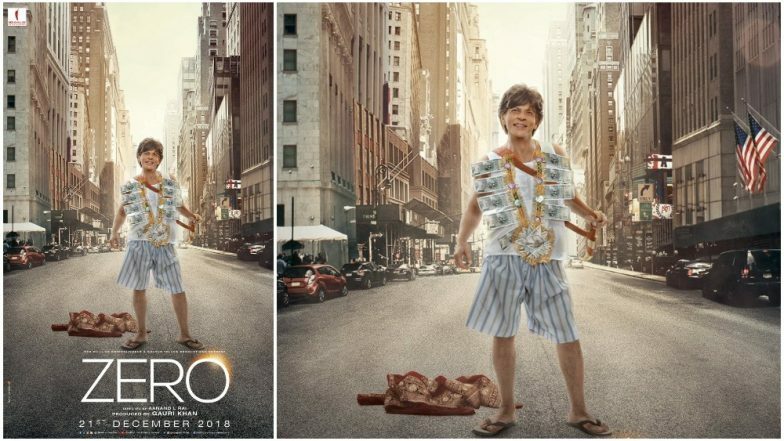 Now as per the latest update by trade analyst Taran Adarsh, Zero has been passed by the British Board of Film Classification. It has been rated 12A. Moreover, we also found that the runtime of the film will be a little more than two hours forty minutes. That means, Zero is packed with enough drama and humour, and hopefully won't lag. The details of the Indian Censor certification are yet to be revealed. Shah Rukh Khan To Recreate THIS Iconic Song From Baazigar for His Upcoming Movie, Zero? Shah Rukh Khan is making sure that the movie gets the widest release when it comes out on December 28. However, it would be clashing with the Kannada film KGF, that is produced by Excel Entertainment, who are also making sure their movie also gets more screens.